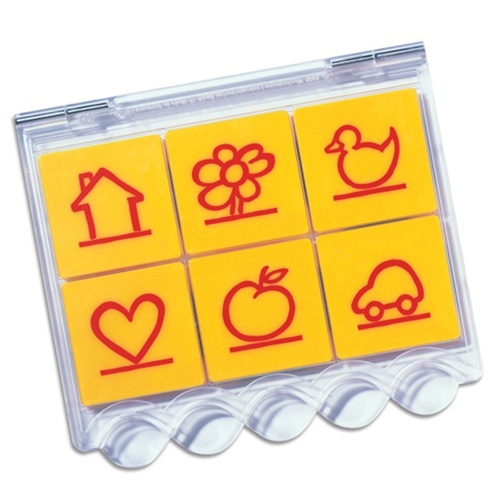 This elegantly designed bambinoLUK Controller unit consists of 6 large and sturdy tiles, each with easily recognized picture symbols, placed in a high-quality transparent case. Its operating model is as easy as 1-2-3 and features a self-checking mechanism. This universal controller is compatible with all current specialLUK and bambinoLUK workbooks sold separately. Static and animated demonstrations illustrating how the controller is used with the books are available. Unlike a traditional workbook with exercises which can be completed only once the bambioLUK exercises can be done many times. Adapting problems by requiring a child to work from the answer to the question, for example, or asking them to explain their process as they work through it adds play time and learning value. The BambinoLUK system is a great tool to help your child build their cognitive skills as they develop perseverance and concentration. The controller is available with all fifteen workbooks in the bambinoLUK Brain Building Complete Set with Controller. It can also be purchased separately for use with the Special LUK titles or with individually selected workbook sets. We regret that this item can only be shipped to US addresses. We welcome orders shipping to freight forwarders and APO/FPO/DPO addresses.